Home > The little trickster! I had kept Rosehair Tarantula's before and wasn't quite as happy with their temperment as I had hoped I would be. I researched many "beginner" T's and looked for varieties that had a friendlier disposition as I wanted one that I could handle. I wasn't looking for a cuddler, I do understand they are more of a "look at" pet, but I still wanted something that could come out of its enclosure occasionally. 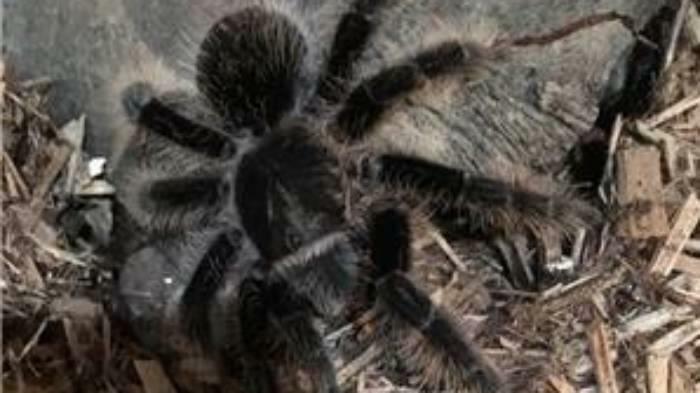 I settled on the Curly Hair T as it got a generally good rating as friendly (for a tarantula). I went to a local reptile and alternative pet expo and found a breeder that had a mulititude of spiders. He had three little Curly Hairs, with She-Lob being the largest. He was a very nice guy, took each spider out and handled it as that was what I was looking for. She-Lob was the chillest and seemed (SEEMED!!) to be the friendliest. That was until I got her home. She isn't named She-Lob for nothing! The instant she was in my care and placed in her enclosure she started throwing hairs from her abdomen. She is currently sporting a nice sized bald spot from flicking those hairs. She is absolutely not handleable in the least but thankfully she is an easy to care for pet. She requires very little, a few crickets a week and clean water and she is happy. I guess. She seems to cranky to ever be truly happy. She is venomous, so there is always that risk that she will bite. She has flicked her fangs at me, yet another endearing quality from the she-devil! I won't ever get rid of her, but she is definitely not a beginner pet and not a friendly pet at that!